Hi, my name is Naomi and I am a racing driver from South Australia. Trophy Class winner in the 2012 Australian Saloon Car Series. 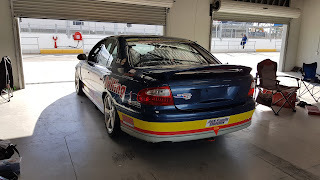 I have been racing Holden Commodore Saloon Cars/Super Six Touring Cars since 2006. Thanks to Frank Walsh Drilling for their ongoing support. I hope you enjoy reading my race reports and updates. 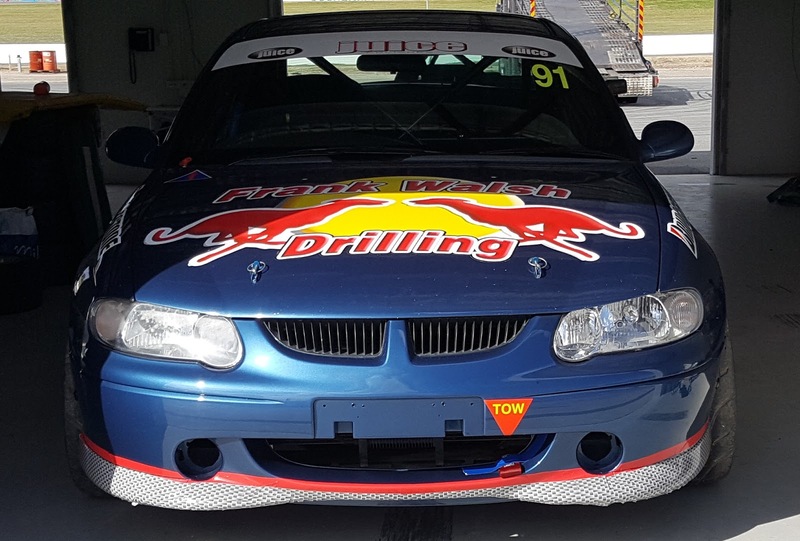 I am very pleased to announce that I will be competing in my Saloon Car at the Adelaide Motorsport Festival on 9-10 December 2017. Tony Hardy and I will be in the Invited Performance class. Big thanks to those who made it happen! Get your tickets here. 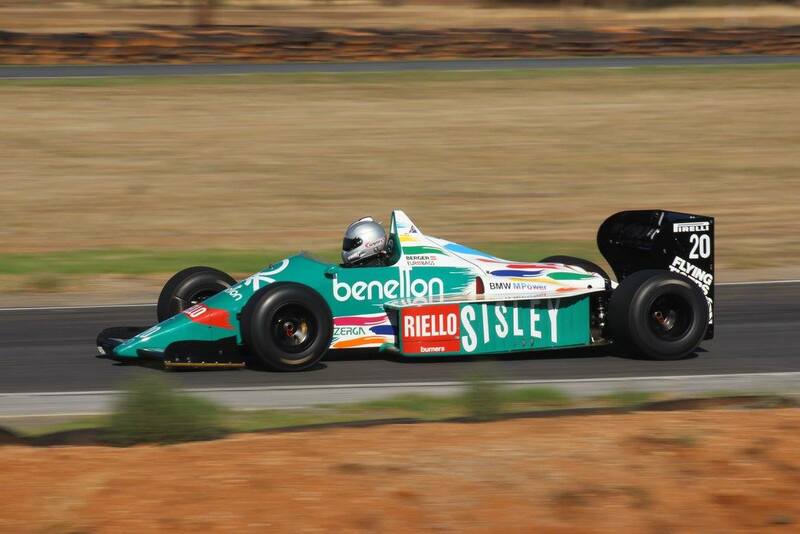 This is a fantastic event featuring a number of classic Formula 1 cars, from the Adelaide era and beyond. Here's a little taste..
P.S. I had the pleasure of helping with this film in September. It was shot entirely on location in the Adelaide CBD, surprising a few locals along the way. If you're wondering why I've been a bit quiet this year - that's because I am not racing at the moment. 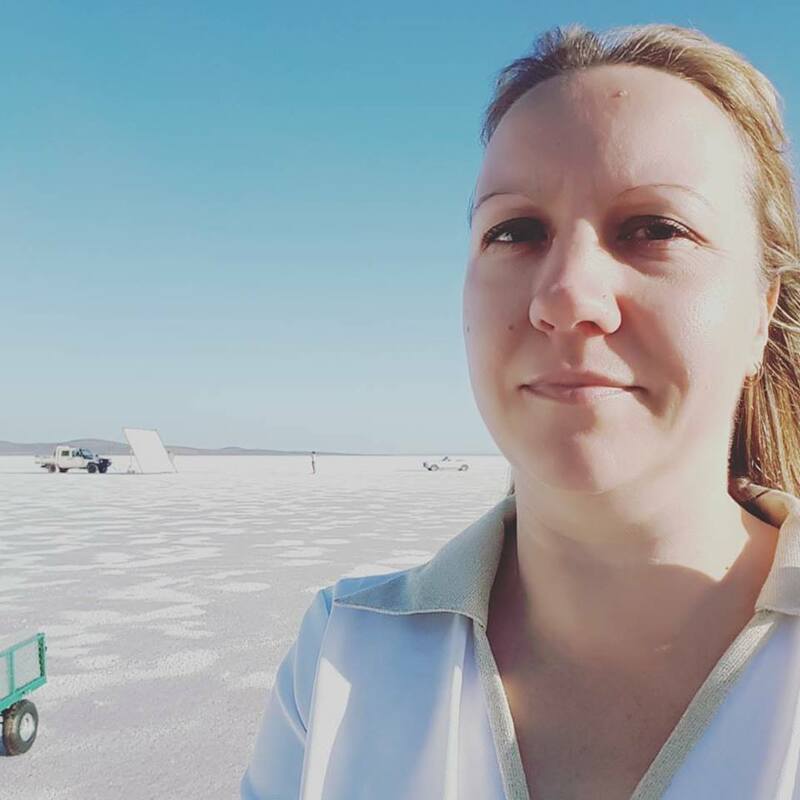 In the first few months of 2017, I have separated from my husband Craig, and had thyroid surgery. While I'm getting back on my feet, unfortunately I won't be at the track. I am hoping to have a run later in the year, either in SA or interstate, so keep an eye on my Facebook page for news. Thanks for your support! I really do appreciate it. Earlier this year, I was hired as a driving double for Filipino TV star Gabbi Garcia. 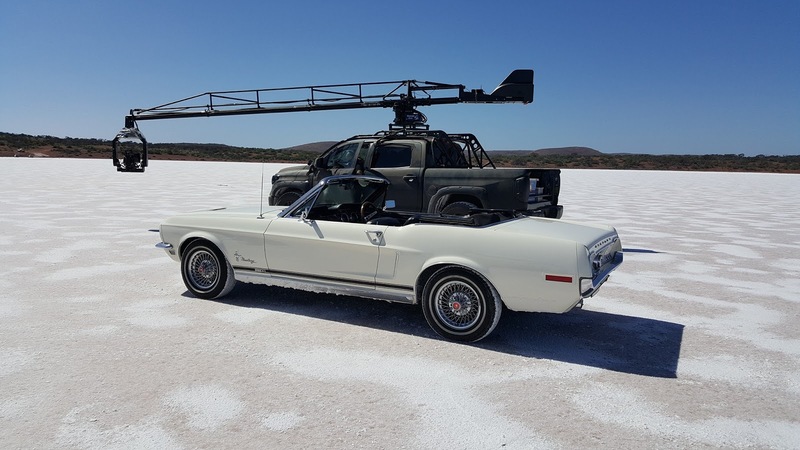 This commercial was filmed at Lake Gairdner, South Australia (better known for its salt lake racing). Scenes were filmed on the lake and in the racing clubrooms. I was driving the Mustang with a black wig on. This was my second TV commercial in a few months, and I hope I can do more in the future. 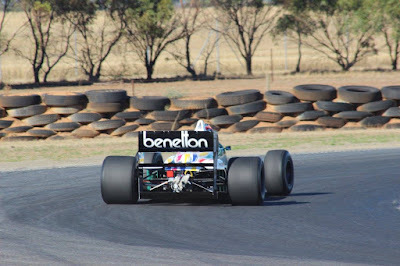 Last weekend found us back at Mallala for the final round of the SA State championship. As is tradition for the first and last rounds for the year, this was a twilight meeting, with our final race scheduled to be run under lights. The weather was all over the place, with scattered rain throughout the day and sunshine in between, and strong winds. For once, it seemed to rain just after most of our races (I have a theory that Saloon Cars attract rain even in good weather - there have been so many times that we've been getting ready to go out when the heavens have opened). Qualifying started out damp. Just as the track started to dry out, more rain came in, followed by sun - and another dry line appeared towards the end of the session. Luke Fraser qualified on pole followed by Pete Holmes, Joel Heinrich, Me, David Lines, and Thomas Walkom in my old VN. Race 1 was dry. I had a great start for once and managed to stay with Joel Heinrich and Pete Holmes for much of the race. Pete had quite a bad fuel leak though, so I was having some grip problems. I ended up dropping back a little & driving off line to avoid it. After the race, he discovered that a fuel line fitting hadn't been done up properly, so luckily it was an easy fix. Race 2 was also dry, but the head wind was starting to affect us. Everyone's lap times were a bit slower than usual. I started 4th and finished 4th once again. Pete and David Lines were having a great battle and I was close enough to be able to take advantage of any small mistakes. Lines had to retire near the end of the race due to an overheating problem. We had made some setup changes to my car that I wasn't entirely happy with, so I had a bit of understeer. Some brake bias tweaking helped a little during the race and we made some more changes before race 3. Race 3 was in similar conditions, but if anything the wind was even stronger. I was happier with my car setup and did my best lap time for the day - but on lap 4 (of 10), the safety car was deployed due to one of the Porsches getting beached in the sand trap at the Esses and the chequered flag came out on lap 9 while we were still under yellows. This was really disappointing but that's racing. We hardly ever see the safety car come out at state race meetings, but it happens a lot at the bigger events. Unfortunately it rained heavily before our last race, so I had the new experience of racing on a wet track under lights. I thought it would stay very wet because the sun was long gone, but a dry line did appear after a few laps. The tricky thing was trying to judge the grip level. Visibility is quite good at Mallala under lights, but you can't see as far ahead as you can in daylight, so it was difficult to see exactly where it was wet or dry in the rapidly changing conditions. I lost a lot of ground off the start and in the first lap and wasn't able to make it up later. I finished 5th. We don't have the final points yet, but it looks like I have finished 2nd overall in the state series. Congratulations to Pete Holmes who is set to be the 2016 champion. Big thanks to all of our sponsors - Frank Walsh Drilling, Walkom Automotive & Performance Engines, Chooks Custom Grafix, Glens Graphix, Bridge Jap & Aussie Dismantlers, On Track Media Management, and everyone who has helped us out during the year (including GH Haulage and Rightway Industrial for the big Perth trip). 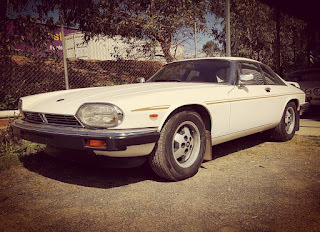 I will be at the Adelaide Motorsport Festival next weekend with my 1982 Jaguar XJ-S on display (Lucas electrics willing) and helping our friends with the 1986 Benetton F1. This will be an awesome weekend once again and I highly recommend going along to have a look. There will be 8 vintage Formula 1s on track along with classic touring cars (including the 1985 Bathurst 1000-winning Walkinshaw Jaguar XJ-S!) and motorbikes. 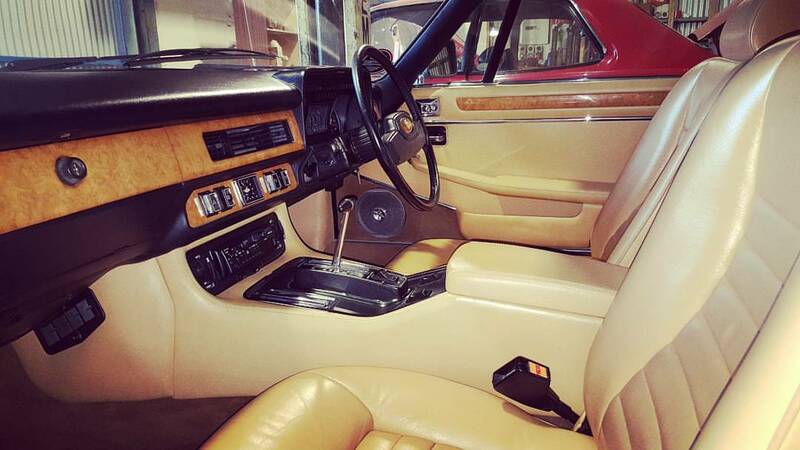 Of course there will be plenty of classic cars on display along with mine. 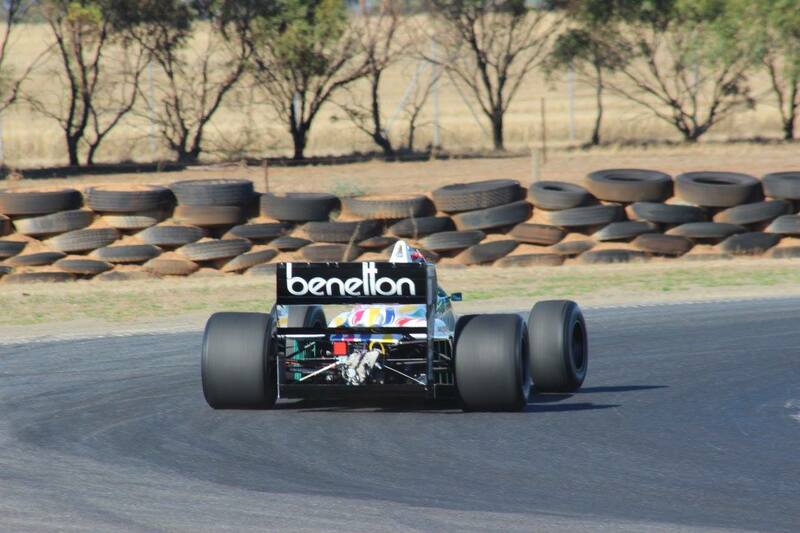 See you there, or at Mallala next year! 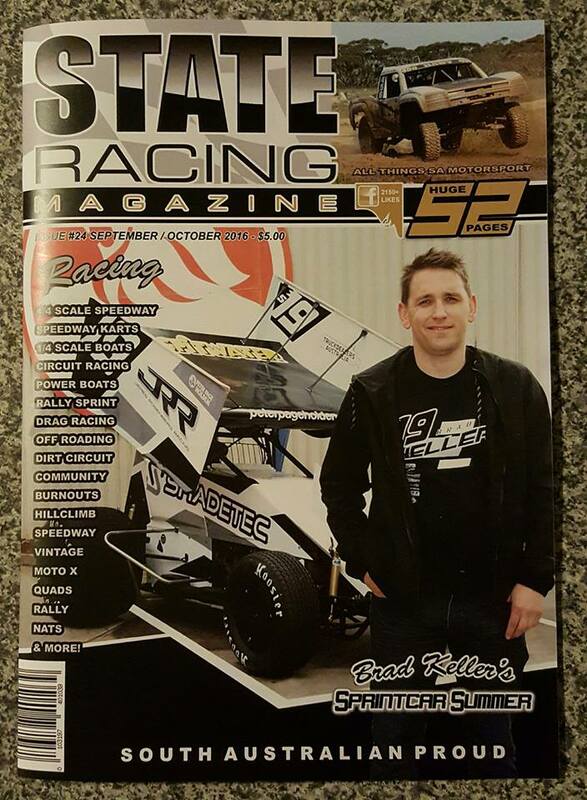 Thanks to State Racing Magazine for featuring a double page article about the SA Saloon Car Competitors' trip to Western Australia. Edition #24 is out now at selected retailers or available online. Last month I had the opportunity to be involved in a TV commercial for the Motor Accident Commission of SA, and it has now been released - check it out on South Australian TV and online! I am driving the white Toyota Camry being tailgated at about the 33 second mark. This year, the Australian Saloon Car Series was replaced with a one-off National Championship race meeting to decide Australia 1. 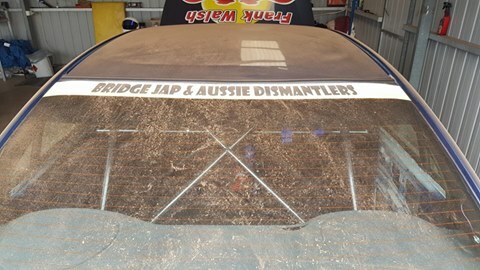 The inaugural Nationals meeting was awarded to Barbagallo Raceway in Western Australia, and eight competitors from SA made the journey across the Nullarbor to compete. 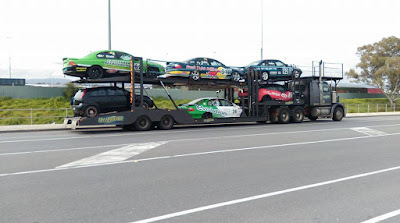 We put our VT (driven by me) and VN (driven by Thomas Walkom) on a truck along with two other SA cars of Mark Bryan and David Lines, and an AU owned by Victorian Phil Gray. Craig and I decided to make a holiday of it by driving across to Perth and taking a couple of weeks to come back afterwards. We did a front panel upgrade to VX headlights and front bumper on the VT before leaving. Practice on Friday started well with a few personal bests on old tyres, and then a bigger improvement while scrubbing in the fresh rubber at the end of the day. I qualified 19th out of 43 cars with a 1:08.1585. I was happy with this time until I saw that the pole sitter did a 1:05.8795 which is very fast! The heats were combined with early and late model cars, but split into two equal sized fields. We each did 4 of the 8 heats. I finished 10th out of 20 in heat 1, followed by 9th in heat 4. Unfortunately I had a DNF in heat 6 after locking the rear brakes going into Kolb corner, and ending up buried in Barbagallo's infamous deep sandpit. We had changed to a different type of rear brake pads just prior to this race, and the crew chief told me to change the brake bias more to the front as they may be a bit 'grabby', and I forgot... The sand tore the rear bumper off of the car, but there wasn't any other damage apart from the car being full of sand. As a result, I started near the back of the grid in heat 8, but was able to make my way back up to 10th. I started the VT/AU final in 18th position (should have been a bit further up if not for the DNF). As we were waiting to go out onto the track, the heavens opened, and we had a very wet track for the 20 lap finale. We did not have any time to change to a wet setup. The start was very wet with poor visibility, and the safety car was deployed due to cars falling off before we had even finished the first lap. There were 2 more safety cars during the race. In these treacherous conditions, my plan was just to finish without losing any spots. Luckily the conditions did improve a little as the race went on, but there was too much water on the track for it to dry out. I stayed on the track and was able to work my way up to 13th before the chequered flag. We would like to say a big thank you to WA locals Damo Stephens and Andrew, Jim, and Des from Rightway Industrial for their assistance & hospitality on this trip. Congratulations Damo on a well deserved 3rd place overall in the VN/EA class. Congratulations also to Thomas Walkom for finishing 5th in the same class in my old VN. Just after returning home, I got the opportunity to drive a car for a road safety advert for the Motor Accident Commission of SA. 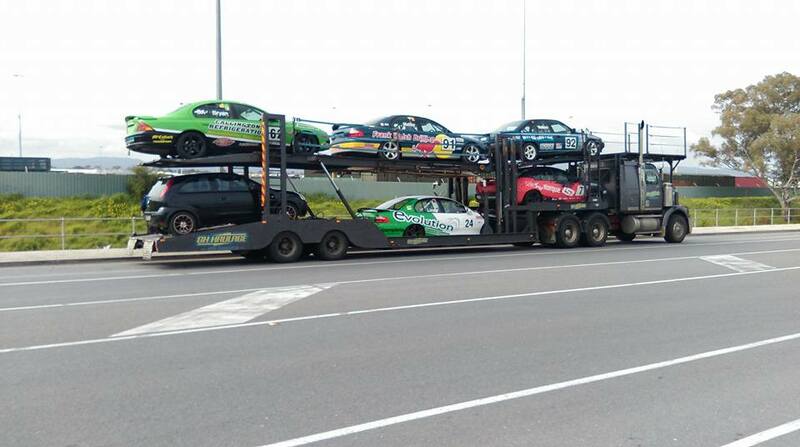 This involved driving a Toyota Camry on Port Road while being tailgated by former V8 Ute racer Gary Baxter. It was an interesting experience - stay tuned for the final product to go to air! Our next race meeting is on 12th November at Mallala for the final round of the Master of Mallala Series. See you there! Round 2 saw us return to Mallala for the SA State Championship in rather 'trying' conditions. Saturday wasn't too bad, but Sunday saw a huge dust storm and very strong winds, followed by heavy rain. I qualified 4th out of 6 Saloon Cars, and finished 3rd in the two races on Saturday. I was 3rd again in race 3 on Sunday morning, although the dust was affecting grip levels and even visibility at times. Race 4 wasn't so good, with me spinning the wheels at the start (and continued spinning the wheels in 2nd gear! ), then had half a spin at the Northern Hairpin; and although I almost caught the car in 3rd by the end, I couldn't quite catch him before the line. Race 5 was pretty bad with a very damp and greasy track. I had two spins and finished 5th, which was last place after David Lines had already gone home with engine problems earlier in the weekend. I did get interviewed by South Australian online racing show On The Throttle during the weekend. Thanks to Cheyanne and Picko for coming out and covering our state race series. Our next race meeting is the Saloon Car Nationals at Barbagallo Raceway in Perth, Western Australia on the weekend of 19th-21st August. This is the same weekend as Round 3 of the SA Series, so unfortunately I will have to miss that meeting. The Nationals will be a huge event though with 50+ entries from around Australia. The VT is currently undergoing some preparation work before going on the truck to WA in a few weeks' time. 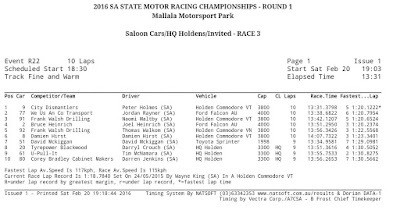 20th February saw us back at Mallala for the first meeting of the season. The SA state series has been changed back to a championship for 2016 (rather than a multiclub series) which I am happy about. We took the VT out to a private practice day on 11th February. It was a fairly warm day but we had a good run. My tyres were getting pretty old and the high track temperature didn't help. There weren't too many cars out there so I had a fairly good clear run. The field was mostly made up of Renault Clios and their drivers were a nice friendly bunch; I'm not sure whether they are a club or just a group of friends.. Quite a few people came to have a closer look at the VT - there is always a bit of surprise when people see that it's a naturally aspirated V6, rather than a V8 or supercharged 6. 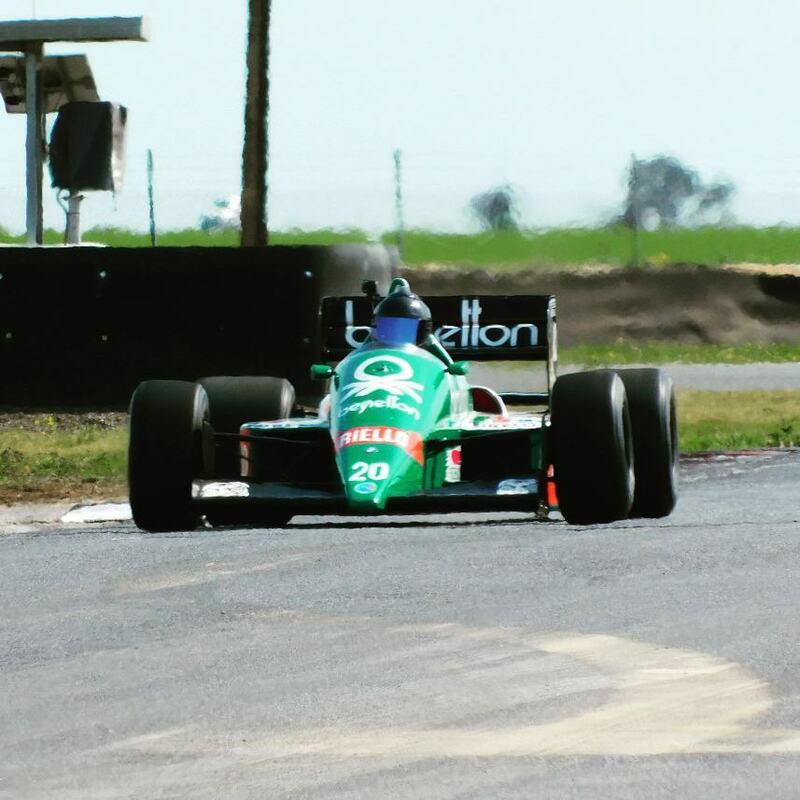 We also shared the day with a 1986 Benetton B186 Formula 1 (chassis number 5), which has been purchased recently by a friend of ours. 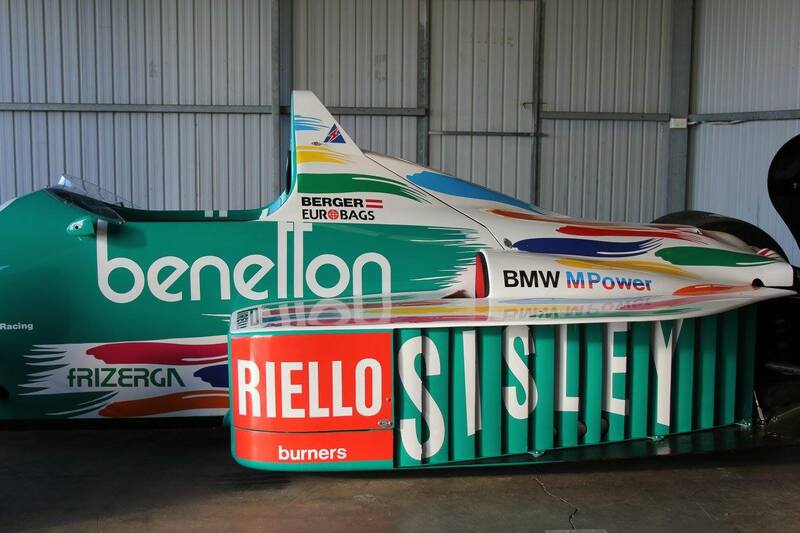 This car was previously driven by the legendary Gerhard Berger and Teo Fabi. 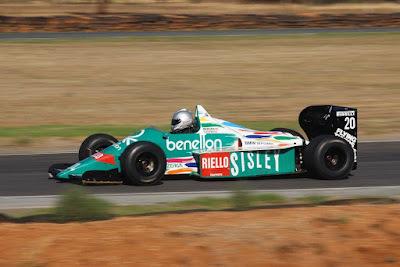 According to Wikipedia, "The Benetton B186, along with the Brabham BT55, Arrows A9 and other BMW engined- cars in 1986 are the most powerful Grand Prix cars ever built. The B186 in particular, being the most competitive of the BMW engined cars that season could throw out 1,350+ hp in qualifying trim, and about 900 hp in race trim." 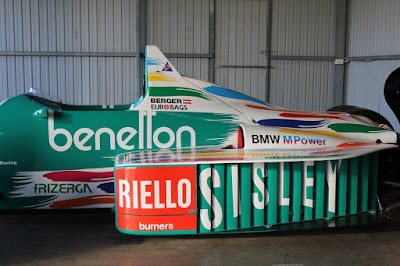 My husband Craig Walkom has been very excited to be able to work on this car recently - who wouldn't be? He rebuilt the gearbox and did some other general maintenance before the practice day. Dunlop V8 Supercar Series driver Josh Kean was the lucky test driver. With that excitement over, we turned our focus back to the VT and round 1. We realised that the tyres were way past their prime, so thanks to Frank Walsh Drilling we bought a new set for the race meeting. Craig also did some work on the gearbox because I have been having a bit of trouble with gear selection (especially going from 2nd to 3rd). When I hit the track for qualifying, something immediately didn't feel right. I almost looped it at the first turn after exiting pit lane, and the car felt quite unstable, with the grip level no better than on the old tyres the week before. We had put a different sized sway bar on the rear and I didn't really like the feel of it so we ended up changing it back to the softer one. That made it a bit better but things still weren't quite right. 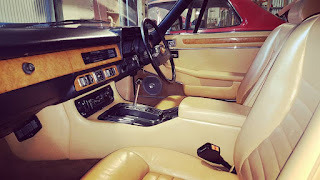 After speaking to our local Saloon Car guru Bruce Heinrich, we discovered that the side walls were different on the new batch of tyres and the pressure had to be adjusted to compensate. This made things immediately better (although the new tyres still don't seem as good as the old spec to me...). I qualified 3rd out of 6 Saloon Cars, and ended up finishing 3rd in all four races, although the order of the others changed around a bit during the day. I did a personal best of 1:20.6524 in race 3 and my times were fairly close to the leaders all day. I think the track was a little slow because some of the others in late model cars would normally be in the 1:19s but everyone seemed stuck in the 1:20s. That's a good sign to me because I still set a PB and maybe could have cracked the 19s on a cooler day.